So here's what i have been up to! Its what made me an absent blogger. I have my own facebook and blog and job and life and 3 kids and a garden and stuff to do. Chuck about 8 hours worth of meetings a week, data integrity and management for a 'start up', managing subscriptions, generating interest enough for near on 600 facebookers and a website with posts to write and pics to take, edit and down and upload, email outs for each weeks new subscribers to manage and send and merge and you can see possibly why I'm not blogging much. AND Im on holidays! (waves at Simon the enterprise co-ord from Food Connect who reads this blog- well used to read it when I actually wrote anything- who started FC here and doesnt hear me whinge - i kindly save that for you online folks). Food Connect Adelaide launched this week and after nearly 6 months of involvement it all came to fruition this week. We started deliveries. 70 this week, 30 more next week and 50 the week after and from there, who-ever joins up. The success of Adelaides first real CSA style organic food network has been unpredictable- its so totally taken off, blown us all away and is 100% excitement. For this here ethicurean its been 100% rewarding being so involved in this fantastic organisation. Its all my principles and beliefs in action and its so truly connecting. im loving it and especially loving being admin for our facebook community; these guys really get involved! So this week, I did the full caboodle. 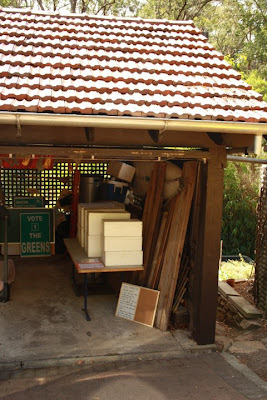 I went down to the warehouse to help pack the fruit and veges, I then loaded up my car with 100% pure organic and local (any idea how bloody incredible and difficult that is) produce (except the organic QLD bananas)and drove home to unload ready for my 11 subscribers to turn up and collect their produce boxes. A thoroughly rewarding day and some amazing produce. 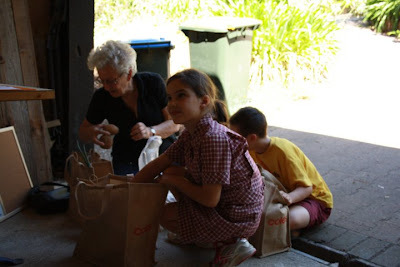 Best bit, when a very active facebooker; a switched on ex orchardist grandma turned up with her excited grandkids to experience ' a new way of shopping' who all proceeded to unpack her box in my driveway into take home bags. Community in action. I really LOVE it. I just wish I was going to be here every wednesday for subscriber pick up! Tomorrow, the state election! Will I have a Bloke or not? ps. In the midst of all this, I managed to kill the mother. Oh not the mother! I was considering asking you to send me some. Never mind I will go and ask my neighbour, hers is only 10 years old, and then I can send you some. Got my first FC box this week, our CC works in the warehouse so hopefully we will get good stuff. Have agreed to swap excesses from our gardens too - fantastic I love it. Sounds like you have been frantic Kel...will it slow down after tomorrow..?? Wishing The Bloke many, many votes. We did the same with our "mother" a little while ago...not even sure quite what happened, it just died. I love the history of yours though. Last weekend when we were out we found a new butcher, quite close to home, who produces all of his own smallgoods...so excited to find hams, salami, pancetta, proscuitto and an astonishing range of sausages all prepared from his own pigs, raised organically and lived a wonderful life. His products contain no nasties either...the double smoked ham was just divine, as was the salami. Very few food miles there. We are heading back tomorrow for more. Wow--sounds crazy in a good sort of way! I did the same sort of thing with our local CSA in the last place we lived: picked up food from a farm about 8 miles away (organic, but not certified) for about 12 families, put it on my front porch, and then they came and picked up their shares. Oh love! I know how you feel. It's such an exciting time for all of us right now. We've been watching with a mixture of pride and amazement at you lot down there. Well done, enjoy the ride, and good luck in the election tonight - Go Simon! How did you kill it? ?